Having spent the best part of two years cleaning the Motorola pipeline of products conceived before the takeover, Google finally has a shop with its name on it. And it's not afraid to use it to challenge some of the old habits and experienced players in the smartphone game. The Moto X was the first to set on a crusade to prove that high-end smartphones go beyond the number of cores and pixels. Now we have the Moto G on a mission to let everyone know that affordability doesn't necessarily imply crippled functionality. The Moto X was unusual enough to be reasonably successful despite its hefty price tag. The Moto G, on the other hand, is priced to move quickly and will be keeping the competition on their toes. Not that it will get complacent because of it, like most of the smartphones priced at around the same level do. The Motorola Moto G will bend over backwards to serve you properly and its list of features stretches far longer than most in this price range. It's abundantly clear that the Motorola Moto G ticks way more boxes than a smartphone of its standing is expected to. Some might argue that it's a luxurious strategy that can only be employed because Google will make profit off software services and not the actual hardware. Well, from a user's perspective (and that's the only one we care about) this point is irrelevant as all that matters is what you are getting for your money. 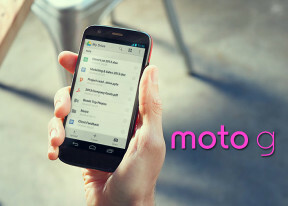 At least on paper, the Moto G is plenty of smartphone for the price. Some corners needed to be cut of course, but since Motorola could afford to give up immediate profits, the hardware didn't take as bad of a hit as it normally would have. We get a base-level chipset of course, but it's of the latest Qualcomm lineup and it should do just fine paired with a 720p screen. And since it requires less power and there's a smaller screen here, Motorola might easily get away with the smaller battery. The unmatched body customization options of Moto X are gone too, but the (very cheaply) replaceable back covers still let you add your personal touch to the smartphone. A well rounded package indeed. Or is it? You see, being able to sell subsidized hardware might sound like a manufacturer's dream, but it's not all roses. Because when you mostly rely on the software to bring in the profits, you have to make sure your services are attractive. So the microSD card slot got the axe in hope that you'll fall back to cloud storage for most of your multimedia needs. The default skinned Android UI (or launcher, as it's technically called) also isn't the most functional around, so you might have to add a feature or two via third party apps. It's always going to be a matter of trade-offs in this price segment of the market and we now set out to find out if Motorola did the right ones. Join us on the next page for the hardware checkup. I bought last week Moto G5. But the battery drain very fast. Not even works for 16 hours. Very bad battery quality.